Garden Bytes from the Big Apple: Solon shows you how. Five years ago, Solon and I went to the local garden center to buy him a plant. He chose an African violet and the African violet thrived. It thrived a lot. We moved it to a bigger pot a few years ago, but this year Solon asked if I could help him divide it. I'm always happy to spend time with Solon AND with plants, so I jumped at the chance. Here's how we did it. First, find two (or more) pots in which to plant your divisions. Solon liked this watering-can pot, but he wasn't sure it would work because there was no drainage hole in the bottom. Without a hole, excess water wouldn't be able to escape, which could lead to root rot. Instead, we chose two, terra cotta, 4" pots for the two divisions. 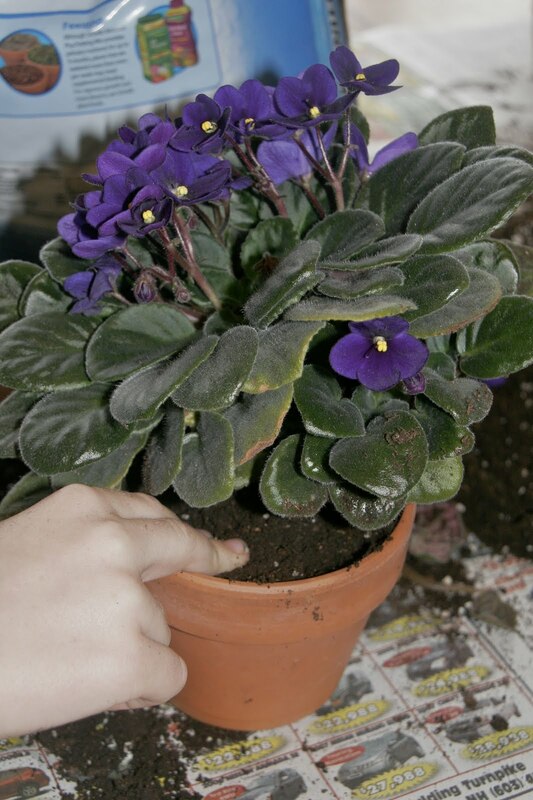 I knocked the violet out of its pot (on newspapers, of course) and told Solon not to be shy. 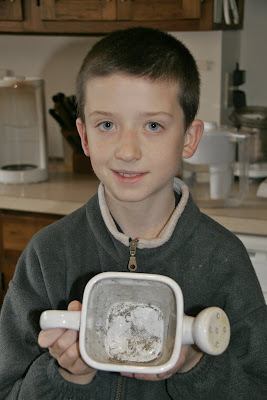 He easily pulled apart the two main clumps of the plant. 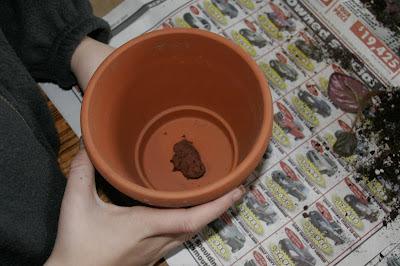 Next, Solon covered the drainage hole with a stone, then poured fresh potting soil into the pot. He added more potting mix around the plant, pushing it in deep. 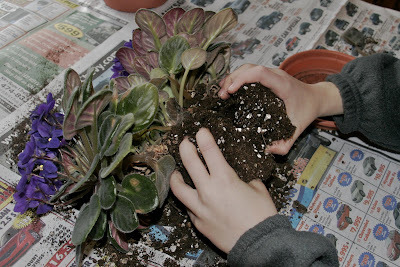 We thought we'd have two African violets after the division, but while we were pulling things apart, we found two mini-plants, trying their best to push up from underneath the leaves of the larger plants. These clumps didn't have many roots, so we decided to try an experiment. We potted them up in 2" pots, then placed each one inside a zip lock bag. 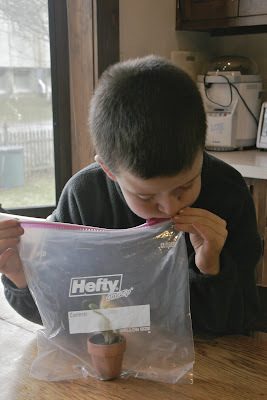 Solon inflated each bag (after reminding me I should say inflate instead of blow up. Apparently blow up means something different to little boys...), creating a mini-greenhouse for each mini-violet. In the end we had two, freshly potted, blooming African violets, and two mini-violets, which Solon has promised to send me regular reports on. He's going to open the bags once a week, check the soil moisture, water if necessary, and re-close the bags. 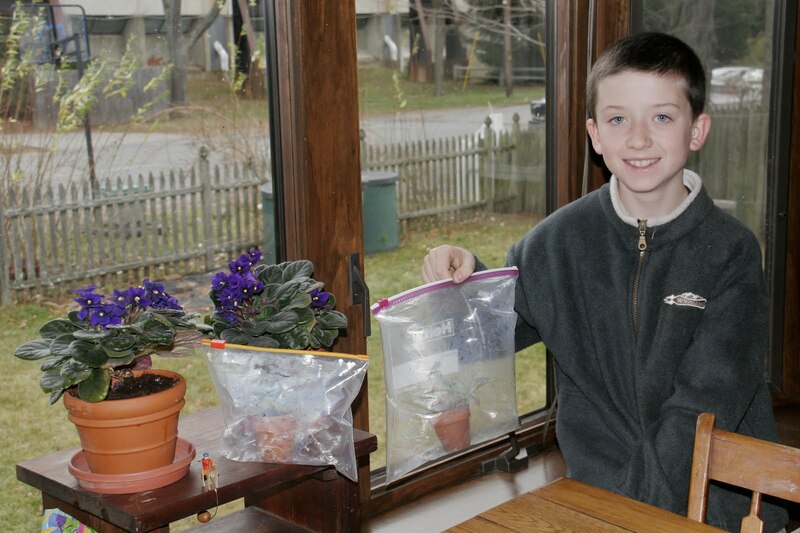 Solon asked what he should do if the plants outgrow their bags. I explained that if they start growing, they've established roots and they can come out of their mini-greenhouses. 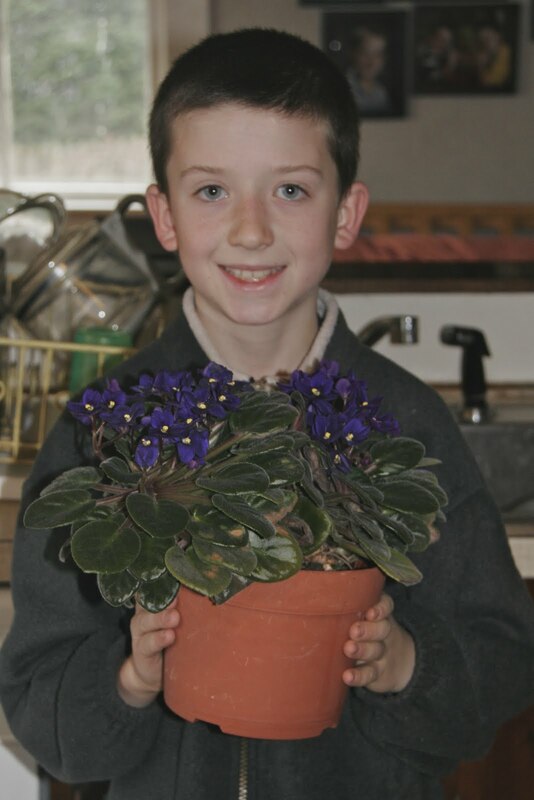 Update: Six months later, Solon is the proud owner of four, floriferous African violets. Way to go, Solon! What a wonderful learning experience for me! Thanks Congrats.